I have been a teacher of English for 24 years, a Headteacher for 9 years and, at the age of 48, this much I know about why we all need nourishment in challenging times. The Choosing by Liz Lochhead is a great starter for a careers lesson. I ended up an English scholar by default. I’m a scientist but after two golfing years out of school I returned at eighteen to take A levels in mathematics (because I could), Economics (because you didn’t need the O level) and (scratching around for a third) English. Such seemingly inconsequential decisions determine our lives. Poetry can transform lives. Marion Greene, my English teacher, identified Owen’s Dulce Et Decorum Est as the poem which made her believe that poetry had the power to affect things beyond the page. For me, as a country lad from an uneducated background who had been potato picking on his hands and knees for 651/2 p a day, it was Heaney’s Digging. Studying Heaney’s poetry was truly life changing. His thoughts about finding a poetic voice seem to me completely true: Finding a voice means that you can get your own feeling into your own words and that your words have the feel of you about them…How, then, do you find it? In practice, you hear it coming from somebody else, you hear something in another writer’s sounds that flows in through your ear and enters the echo-chamber of your head and delights your whole nervous system in such a way that your reaction will be, “Ah, I wish I had said that, in that particular way.” This other writer, in fact, has spoken something essential to you, something you recognise instinctively as a true sounding of aspects of yourself and your experience. And your first steps as a writer will be to imitate, consciously or unconsciously, those sounds that flowed in, that in-fluence. They f*** you up, your mum and dad. Heaney’s Follower explores his sometimes troubled relationship between his farming background and his academic life-path. One of my early awkward poems acknowledged my debt to Heaney, how my poetic voice mimicked his and on a deeper level how my study of his poetry led me away from my roots. Heaney’s sonnet series Clearances at the heart of The Haw Lantern sees him make the ordinary extraordinary. In the sonnet, When all the others were away… he holds the line between magnificence and mawkishness with lyric dignity. 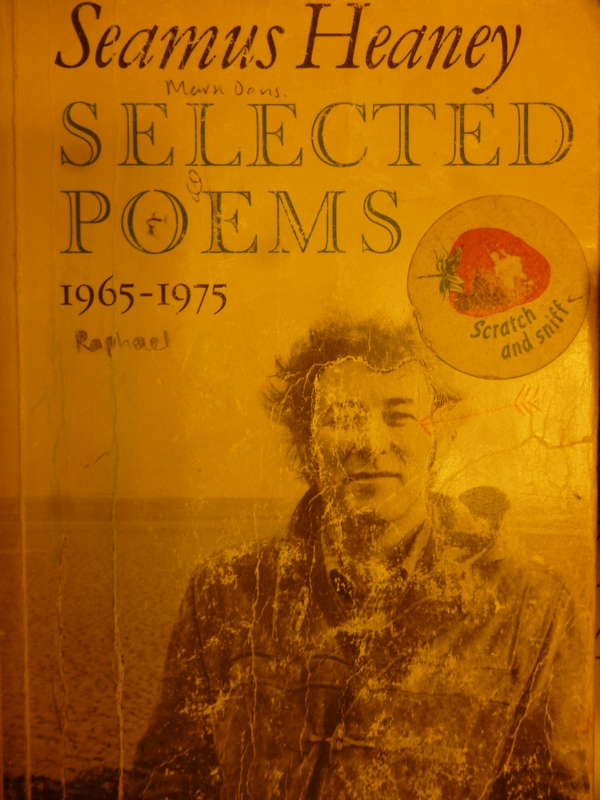 The only poem I’ve managed about my dad of any worth has Heaney’s influence woven throughout; it won the 1988 Robin Lee Memorial Poetry Prize at the University of Sussex. The theme for this year’s University of York’s Festival of Ideas is North and South, apposite for a Sussex boy living in York. And Famous Seamus is reading! Get your ticket here! Authenticity is so important. 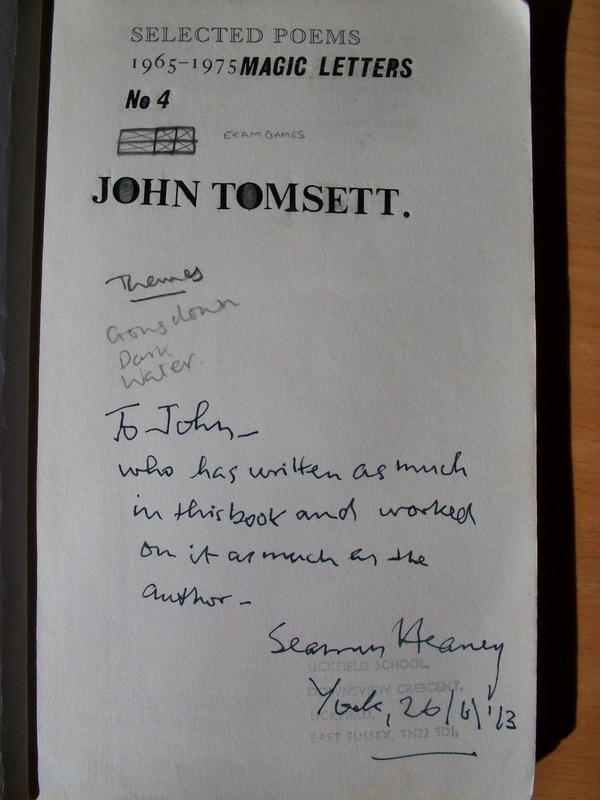 When I last heard Heaney read he signed my brand new copy of his version of Beowulf. When I hear him in a couple of weeks, it’ll be my A level text of his poems – scratch and sniff sticker, arrow in the side of the head and all – which I’ll give him to sign! Sometimes you intuitively pursue an opportunity and it blossoms into something quite remarkable. Last August Sophie Coulombeau emailed me about a project called StrangeBedfellows: creativity vs analysis in the age of austerity. Ten months later and our students have an exhibition at the Festival along with Heaney. And if you haven’t read Sophie’s book Rites, you should! PostScript: Defend Sir Ken! My colleague Alex Quigley @HuntingEnglish and Tom Bennett @tombennett71 both had a right pop at Sir Ken Robinson last weekend! Of course they still love him, but if they planted any doubt about our man in your minds have a look at this video, What inspires Sir Ken? Question from microphone number 2: My little brother says your poems are just death and potatoes. Are there two other words to describe your poetry you’d want us to take away tonight? That is a beautiful poem John. Thank you for sharing this with us and for making a very important point. Efficiency, certainty and progress must always be balanced against emotion, intuition and uncertainty. Otherwise, really, what’s the point? I was going to be a professional ballet dancer, strange how things work out isn’t it? I hope you still get to golf. I love the work of Seamus Heaney too but I recall being blown away by Dulce et Decorum Est in high school. I was 15 and the words transported me, faster than any Tardis, back to the trenches. My English teacher was Miss Trotter and she loved English with a passion which was palpable even to her spotty, hormonal charges. She wore a black academic gown with sleeve pockets laden with chalk, car keys, coins and other assorted unknowns. She would swing and slam one sleeve down on the wooden desk top to punctuate a statement or question. Puffs of chalk dust would erupt from her sleeve as she did so. Very dramatic, very eccentric and I thought she was brilliant. Dulce had a powerful effect on me, physically and emotionally. I love that poems can do that. I try very hard to bring a Miss Trotter-esque love of language to my pupils. Witnessing a similarly positive, primeval response to text ( or indeed learning in general) in another human being is exciting and very rewarding as a teacher. As a Headteacher these days , my opportunities for direct teaching are diminished but my love of teaching poetry remains. I try to keep my hand in whenever possible. Even if my attempts don’t achieve my poetic aim with every pupil I am somehow nourished in the process. Beautiful post John. It seems many are trying to intellectualise and reduce teaching to a formula. This is a breath of fresh air and reminds me that there is so much that cannot be quantified, nor explained. I am a physicist and used to try to analyse why some poetry moves me. I have given up and just let myself be moved. As for defending Sir Ken, I see him as a catalyst for change, not as the solution. We are the ones that need to react to bring about the change that few don’t believe is needed. Finally as an ex-potato picker of a similar age – I got paid more than you! You are a clever and wonderful man Mr Tomsett!! And I’m happy to stick up for Sir Ken too. Amid the drudgery, don’t we need people like him? I think so. Many thanks for this, John. It took me back to teaching Liz Lochhead and Seamus Heaney during my years as an English teacher – and I’ve used ‘The Choosing’ in assemblies too. Special times! Thanks for sharing your own poetry too. Ross McGill posted the question this morning – what was on our ‘to do’ list today which is to do with education, and what were we going to do that was outside education. I felt a bit alarmed because I have a long list of things to do today which are ALL to do with education (and catching up with blogs/Twitter and tonight’s #SLTChat are on the list!) But reading this blog and watching the videos has refreshed and reinvigorated me. Thank you!